36th goes off to the right, but was that where US 38 began... or simply where it separated from US 30? 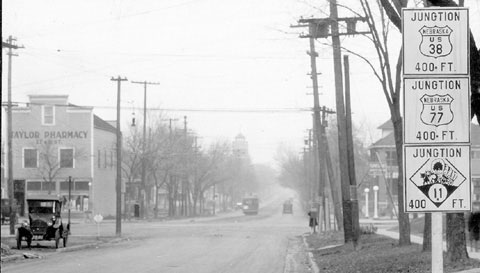 Given the timeframe, it would have been typical for the US 38 designation to extend ahead on Farnham, overlapped with US 30 perhaps to 18th Street, where the courthouse is located. Today US 30 does not serve Omaha. US 6 does, but traffic is not routed along Farnam. 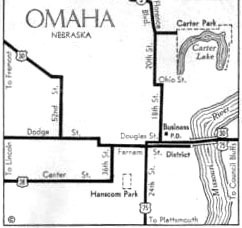 Today Dodge Street is Omaha's east-west "Main Street" all the way through the city (the map above illustrates how US 30 jogged up to Dodge a little further west of 36th). US 38 apparently followed Center west to 132nd Street, then south to Millard. 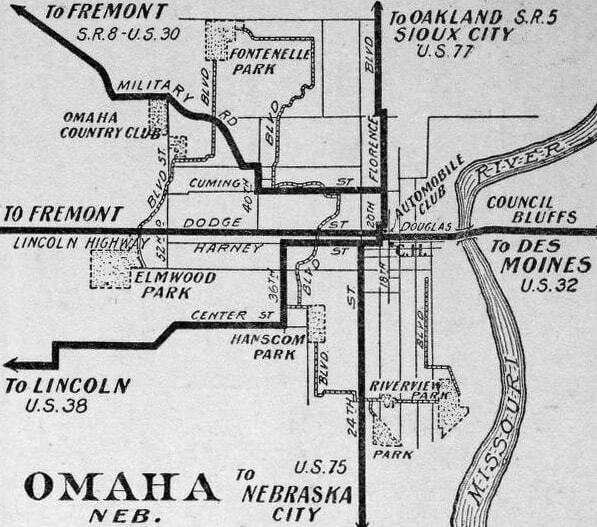 It probably used today's Millard Avenue to get to Q Street, which it then followed west -- probably to 204th, and then south to the town of Gretna. 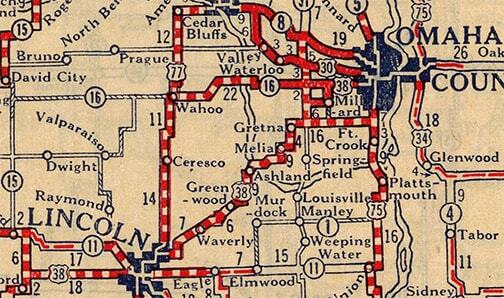 From there, US 38 continued west essentially along what is now US 6: through Lincoln, Hastings, Holdredge, and McCook. Then into Colorado, serving Holyoke and Sterling (which explains the seemingly-misnumbered US 138). From Sterling, US 38 continued along the South Platte River, through Brush and Ft. Morgan. 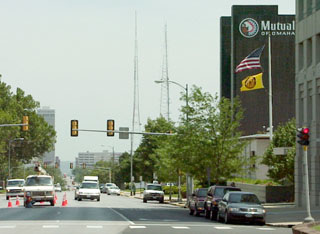 At Wiggins, instead of following the "Denver Cutoff", US 38 traffic was directed to continue alongside the Platte to Greeley, on the road that is now US 34.
last updated Aug. 13, 2016.